Tonight’s debate theme is foreign policy. President Barack Obama and Mitt Romney will have an hour and a half to discuss in detail their positions on how the United States will influence the world’s affairs in the next 4 years. The foreign policy for the Middle East will likely be at the center of the debate. What should be done in regards to the nuclear program in Iran? Should the United States intervene in Syria? How much weight do Israel’s needs have on the United States’ foreign policy? How will we help the new democratic governments that hatched from the Arab spring? 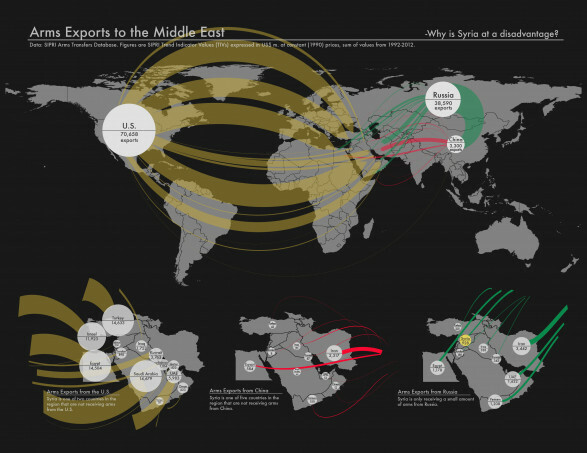 The following infographic discusses the question of arms exportation in the the Middle, a question that will probably not be addressed. However it provides a visual that can help put in perspective the threats in the region. American weapon exportation in the region for the last 20 years outweighs massively the support that “rogue states” have received, highlighting that the region is not necessarily a direct threat to the United States. by zakscloset. Browse more data visualization.